Hoylake is a seaside town within the Metropolitan Borough of Wirral, Merseyside, England. The town is located at the north western corner of the Wirral Peninsula, near to the town of West Kirby and where the River Dee estuary meets the Irish Sea. The Peninsula was part of the historic county of Cheshire, at the time of the Domesday it was within the Hundred of Wilaveston. At the 2001 census, the population of Hoylake was 5,710 of a total population of 13,042, as part of the Hoylake & Meols local government ward. By the time of the 2011 Census population figures for Hoylake were no longer maintained. However figures do exist for the ward of Hoylake and Meols. The total population at this Census was 13,348. In 1690, William III set sail from Hoylake, then known as Hyle or High-lake,[nb 1] with a 10,000-strong army to Ireland, where his army was to take part in the Battle of the Boyne. The location of departure remains known as King's Gap. The previous year a large force under Marshal Schomberg had also departed from Hoylake on 12 August, crossing to Ireland to capture Carrickfergus. The present day township grew up in the 19th century around the small fishing village of Hoose. The name Hoylake was derived from Hoyle Lake, a channel of water between Hilbre Island and Dove Point. Protected by a wide sandbank known as Hoyle Bank and with a water depth of about 20 feet, it provided a safe anchorage for ships too large to sail up the Dee to Chester. To facilitate safe access into the Hoylake anchorage, two lighthouses were constructed in 1763. The lower light was a wooden structure that could be moved according to differing tides and shifting sands to remain aligned to the upper light, which was a permanent brick building. Both of these structures were rebuilt a century later. The upper lighthouse, consisting of an octagonal brick tower, last shone on 14 May 1886 and is now part of a private residence in Valentia Road. The lower lighthouse, closer to the shore in Alderley Road, was deactivated in 1908 and demolished in 1922. The Royal Hotel was built by Sir John Stanley in 1792, with the intention of developing the area as a holiday resort. The numerous steam packet vessels sailing between Liverpool and North Wales which called at the hotel provided valuable patronage. By the mid-19th century a racecourse was laid out in the grounds of the hotel. The hotel building was demolished in the 1950s. Hoylake's lido, located on the promenade, was opened in June 1913 and rebuilt in the late 1920s. In 1976, the Hoylake Pool and Community Trust took over the running of the facility from Wirral Borough Council. The baths finally closed in 1981. The Hoylake and West Kirby War Memorial is a notable local landmark, as it was designed in 1922 by the British sculptor Charles Sargeant Jagger who was responsible for a number of war memorials around the world, including the Royal Artillery Memorial at Hyde Park Corner in London. The township of Hoose was part of the West Kirby Parish, Wirral Hundred. It became part of Hoylake and West Kirby civil parish in 1894. The population was 60 in 1801, 589 in 1851 and 2,701 in 1901. Hoylake was governed by an urban district council until 1 April 1974 when it was absorbed into the newly created Metropolitan Borough of Wirral when local government reorganisation took place across the UK. At that point, Hoylake ceased to be in Cheshire, and became part of the nascent county of Merseyside. Hoylake is at the north-western corner of the Wirral Peninsula, and is situated on the eastern side of the mouth of the Dee Estuary and adjacent to the Irish Sea. 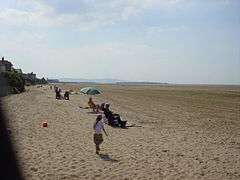 Hoylake is approximately 11 km (6.8 mi) west-south-west of the River Mersey at New Brighton. The centre of Hoylake is situated at an elevation of about 9 m (30 ft) above sea level. Hoylake is a largely residential area and there is an active nightlife in the town centre, which is located at the original village of Hoose. Hoylake includes the independent Kingsmead School, which educates girls and boys from 2 to 16 years old. Hoylake Holy Trinity C of E Primary School is the town's main primary school, educating children from the ages of 3 to 12. Hoylake is the home of the Royal Liverpool Golf Club, built in 1869 on the site of the Royal Hotel racecourse. It is the second oldest golf links in England, predated only by the Royal North Devon Golf Club, in Westward Ho!, Devon. It has hosted many major tournaments such as the Open Championship and the Walker Cup. The club is often referred to as "Hoylake". It hosted the Open again in July 2006, after a gap of almost 40 years, with Tiger Woods earning the Claret Jug for the second year in a row. The 2014 Open Championship is the most recent of the event to be held at Hoylake. This was won by Rory McIlroy. Hoylake-born amateur golfer John Ball Jnr. won the Open in 1890, becoming the first Englishman to do so. Another local amateur, Harold Hilton became Open champion two years later. He won again in 1897 at his home club of Royal Liverpool. On the other side of Meols Drive and the railway is Hoylake Municipal Golf course which is used by Hoylake Golf Club (since 1933), West Hoyle GC and Irby GC. It was used as the 2006 Open Championship practice course. Hoylake RFC rugby club was founded in 1922. They currently play in South Lancs/Cheshire Division One, the seventh tier of English rugby. Its predecessor, connected with the Royal Liverpool Golf Club, had been founded in the 1890s. British Open golf champion Harold Hilton was also captain of the rugby team for the 1890–91 season. Hoylake ASC was founded in 1931. The club now trains at the West Kirby Concourse and the Calday Grange Swimming Pool. Hoylake Sailing Club was founded in 1887 and has a clubhouse and boatyard on North Parade. The club hosts an annual regatta and sends a team to the Southport 24 Hour Race. Hoylake is one of the premier sites for sand yachting in Britain, with banks around a quarter of a mile offshore. The town's beach was the venue for the European Sand Yacht Championships in 2007 and 2011. Cricket was played at the now disused Ellerman Lines Cricket Ground from as early as the 1920s, when the then newly formed West Wirral Cricket Club played at the ground. It was later sold to Ellerman Lines, who transformed the site into their social club. Cheshire played minor counties cricket there from 1957 to 1968. The ground also held Cheshire's first ever appearance in List A cricket against Surrey in the first round of the 1964 Gillette Cup. The ground was later sold, with the site becoming a nightclub, before being demolished following a fire. The site of the ground has been selected for construction of 62 affordable homes. Joshua Armitage, pen-name "Ionicus" (1913–1998), the "Punch" artist and designer of covers for Penguin's editions of P.G. Wodehouse, was born in Hoylake and lived and worked there his whole life. Julian Budden, Italian opera scholar and BBC radio producer (1924–2007) was born in Hoylake. The former Olympic Games cyclist Chris Boardman (1968- ) was born in Hoylake. Actor Daniel Craig (1968- ) grew up in Hoylake. Lieutenant Colonel Jack Armand Cunningham (1890–1966), the World War I flying ace, retired to Hoylake and eventually died there. Author Helen Forrester (1919- ) was born in the town. Composer and producer Hammy Havoc was brought up in Hoylake. Pianist Stephen Hough (1961- ) grew up in Hoylake. The former actress and Labour MP Glenda Jackson (1936- ) grew up in Hoylake. John Lennon's first wife Cynthia grew up in Hoylake and returned there after their divorce in 1968. Their son Julian (1963- ) spent much of his early life in Hoylake. Comedian Eric Morecambe won a local amateur talent contest, held at Hoylake's Kingsway Cinema in 1940. Mike Rutherford (1950- ) of Genesis was a boarder at the Leas School, formerly on Meols Drive. Curtis Warren (1963- ), Merseyside gangster, formerly featured in the Sunday Times Rich List, owned a house on Meols Drive. Cliff Williams (1949- ), bassist of AC/DC grew up in Hoylake. Indie rock bands the Rascals and the Little Flames are from Hoylake. James Skelly, Ian Skelly, Bill Ryder-Jones, Nick Power, Lee Southall, Paul Duffy and John Duffy, from the band the Coral, were also brought up there. ↑ High lake is also mentioned, with regard to William III's army travelling to Ireland, in the BBC programme Who Do You Think You Are?, Series 12, Episode 3. ↑ "Coordinate Distance Calculator". boulter.com. Retrieved 6 March 2016. ↑ "Ward population 2011". Retrieved 1 June 2015. ↑ Denham, Henry Mangles (1840). Sailing directions from Point Lynas to Liverpool. Google Books. Liverpool: Mawdsley. p. 95. Retrieved 27 August 2015. ↑ Bartlett, Thomas; Jeffery, Keith. A Military History of Ireland. Google Books. Cambridge University Press. p. 193. ISBN 9780521629898. Retrieved 3 September 2015. ↑ Young, Derek; Young, Marian (1984). Pictures From The Past: A unique collection of photographs of old Hoylake, Meols and West Kirby. ASIN B001KA5LEY. ↑ Robinson, John; Robinson, Diane (2007). Lighthouses of Liverpool Bay. The History Press. ISBN 978-0-7524-4209-9. ↑ "Hoylake Amateur Swimming Club has uncovered archive film of the town's outdoor Lido as part of its 75th anniversary celebrations.". BBC. 19 Oct 2006. ↑ "SRTM & Ordnance Survey Elevation Data in PHP". Retrieved 1 November 2016. ↑ "Ground profile: Ellerman Lines Cricket Ground, Hoylake". CricketArchive. Retrieved 12 July 2012. ↑ "Supporting Planning Statement: Former Ellerman Lines Social Club, Carr Lane, Hoylake" (PDF). www.wirral.gov.uk. October 2011. Retrieved 12 July 2012. Anon. (1951). Hoylake and West Kirby: Official Guide. Burrow. ASIN B0000CJ89L. OCLC 810774865. Boumphrey, Ian; Boumphrey, Marilyn (1984). Yesterday's Wirral: West Kirby and Hoylake. Ian & Marilyn Boumphrey. ISBN 9780950725529. OCLC 655410017. Hume, Abraham (1847). The Antiquities found at Hoylake in Cheshire. London. ASIN B0014I23CK. OCLC 47290451. Mortimer, William Williams (1847). The History of the Hundred of Wirral. London: Whittaker & Co. pp276-278. O'Neill, Jim (2006). West Kirby to Hoylake. Nonsuch Publishing. ISBN 9781845883317. OCLC 33046870. O'Neill, Jim (2012). Hoylake Then & Now. The History Press. ISBN 9780752467931. OCLC 766318454. Roberts, Charles (1986). Victorian Hoylake: Recollections of Hoylake, 1865-1915. Ceejay Publishing. ISBN 9780948805004. OCLC 15658615. Roberts, Stephen (1992). Hoylake and Meols Past. Phillimore & Co Ltd. ISBN 9780850338270. OCLC 30029021. Wikimedia Commons has media related to Hoylake.